Arrive late in night on inaugural KLM direct flight from Amsterdam to Lusaka. Runway is awash with dignitaries and dancing tribesmen. Surprisingly quiet town of 3 million with much construction and several South African style malls, suburban cafes with good wifi and excellent coffee. You can do most of your shopping at the stop lights as vendors crowd around with everything imaginable. Once weekly market on grounds of church brings everyone out to eat from curry stands and homemade cake options baked by Dutch Reformed matrons. Absolutely delightful with vendors from as far north as Kenya mixing in with flower sellers, Malawian wood workers (bought a table … yes day one and the luggage already hard to deal with!). 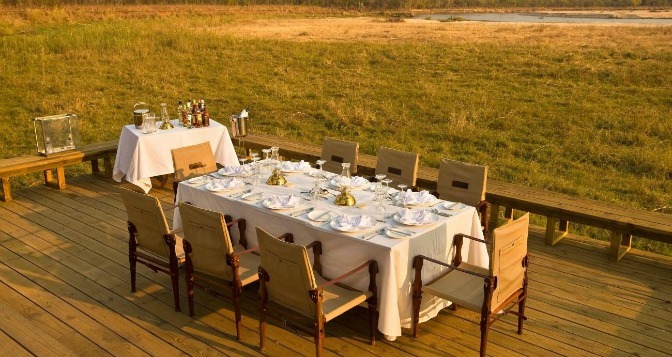 Later we visit for lunch on the veranda with owners of Chiawa Camp (voted Best Safari Lodge in Africa 2011 and 2012). 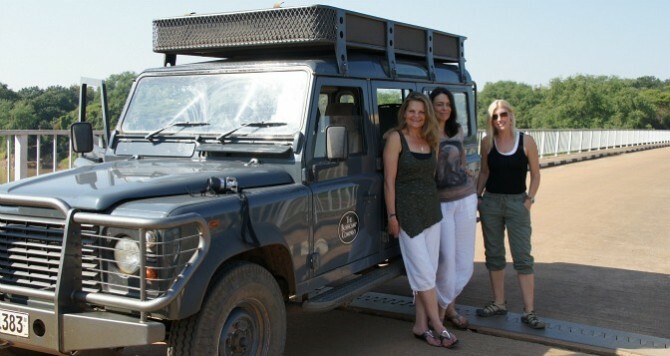 We are due to visit there in a few days…for now, off to South Luangwa National Park on a very small plane. 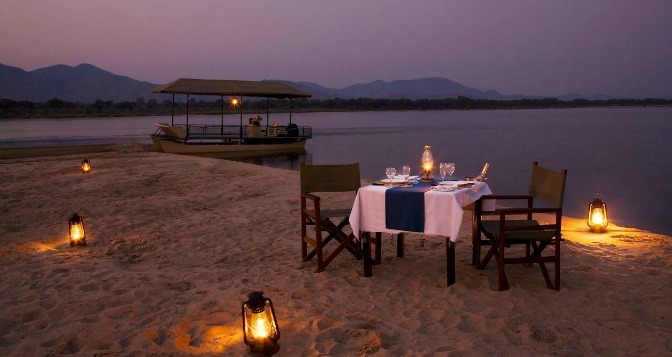 South Luangwa one hour by charter from Lusaka, arrive Mfuwe airport and Robin Pope Safari guide rendezvous to begin journey through villages to Luangwa House where guests and friends are in for a surprise. Seven foot high grass threatens to take over the road, bicycles and children waving everywhere, villages with packed mud yards, chickens, dogs and men around cooking fires on a Saturday afternoon. 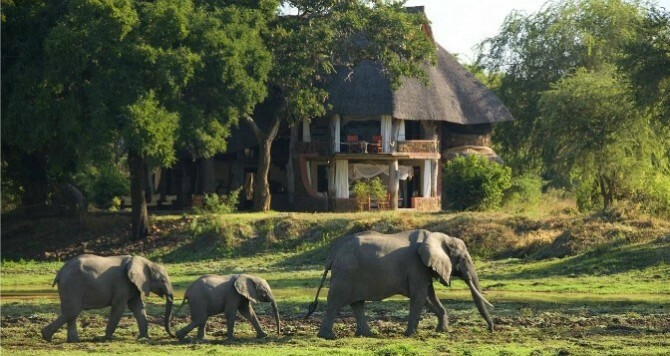 Luangwa House sits overlooking wide wet-land channel, elephants roaming around in the garden just metres from the house and pesky baboons in jackleberry tree on deck. Quick siesta (the famous rejuvenating 20 min nap! ), and then welcome friends and guests who are not expecting me. Cocktails and dinner and much talk of Africa and Zambia and all the other places they have seen on their journey. Three days of safari – leopards almost every day, breakfasts overlooking river and soak in copper tub for some on return to camp. Guests jet off to Johannesburg and I carry on to Puku Ridge. More friends and a special birthday dinner with singing and cake under African stars. Fantastic walk at sunrise with Philimon – a font of information on bush medicines. Leopard at night, a giant porcupine sighting and sunset drinks on ridge looking out to massive nothingness. Unfortunately, for travelling companions the “safari express” has begun … travel through rivers and over flooded bridges for lunch at Mfuwe Lodge with baboons who steal anything you don’t have in your hand, a quick 20 laps in their pool and then on to The Bushcamp Company’s Bilimungwe Camp 3 hours away. 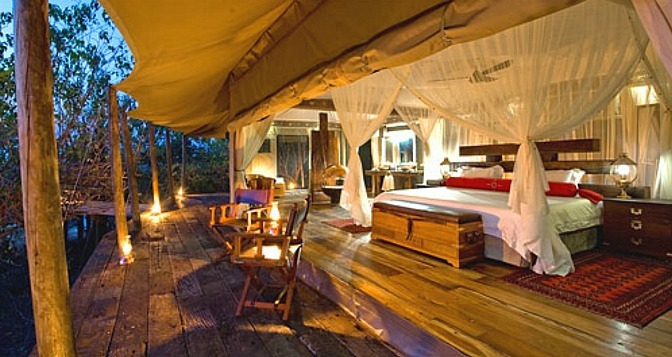 Manage to visit 4 out of 6 of the fantastic Bushcamp Company properties. 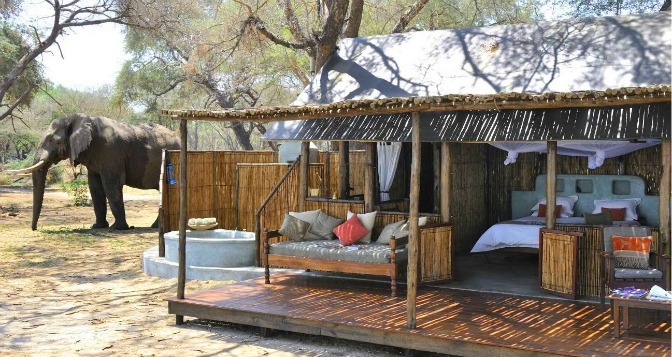 One night at Bilimungwe, 4 spacious thatched chalets with fantastic bathrooms and public area worthy of all day lounging. Lion in camp makes sleeping a little difficult as he roars – how does one sleep at all after that? Camp Manager Simon, former Rugby player with the Harlequins in London says he thinks lion was actually on his deck … rugby players … always making stories bigger than they really are. 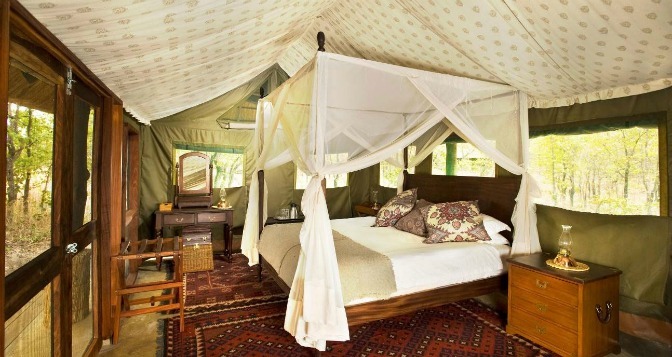 Chindeni Camp with star-gazing bean-bags and wicked cocktails and then Zungulila where Marrakech meets the South Luangwa, carpets and campaign furniture in a small, romantic camp on the river. Middle of the night visit from elephant who decided tree on the other side of tent from my head was his dinner … could hear him breathing and chomping. I move my head to the other end of the bed in case he falls over and into the tent. Finally visit Kapamba with cooling splash in the river and a full moon. Then back to Mfuwe, civilization… and the hippo’s “salad bowl” overlooked from the spa there. Andy Hogg, owner of The Bushcamp Company, once told me the only thing children are good for is having really small ones stand beside you so you can rest your beer on their head. I know now that he was not telling the truth. Andy and folks from Bushcamps and Mfuwe Lodge have made a difference in so many children’s lives – changed them in fact beyond imagination. First hand visit to the Mfuwe Basic School and the +1000 students there – all supported through Bushcamps and others in South Luangwa. Boy’s dorm for borders possibly 25 m x 10 m houses 100 boys! But they are being educated and they are the fortunate few who have support from Bushcamps and guests who adopt them. Many are double orphans (no parents) – plus they are looking after younger siblings back in their villages. Nowhere is education more critical. On graduation they have possibility of job with Bushcamps or Mfuwe Lodge. Teachers and school facilities have been built by Bushcamps, books, supplies and library all funded … but in need of more. Big travel day today as we leave Bushcamps and head to airport at Mfuwe for flight to Lusaka and then onward to Lower Zambezi National Park. 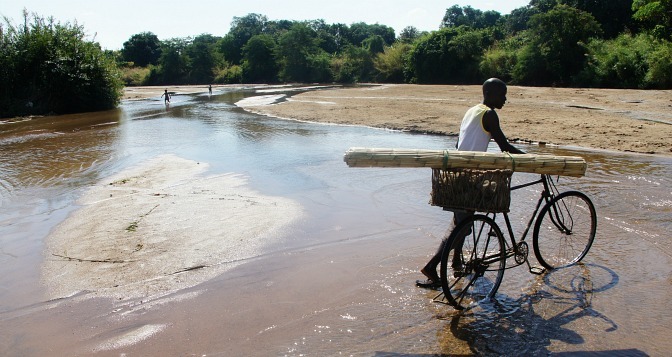 Landscape changes over the mountains into the valley, river wide and filled with sand bars. Zimbabwe looms on the other side. We arrive to a beautiful lodge on the banks of the river. Multiple guides and multiple activities keep us busy canoeing, walking, fishing and game viewing. Dinners with much arguing over the value of the travel agent – easy to defend first-hand knowledge. We spend one night at Old Mondoro, smaller, simpler camp just down river. Elephant in camp sends us scampering for cover in the dining room although we are assured there is no danger. 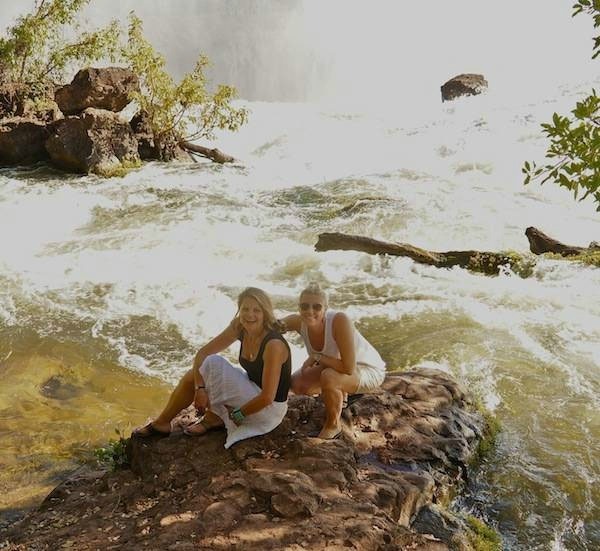 The Safari Express spirits south to Victoria Falls where we attempt to stay dry in the rainfall and rainbows of “smoke that thunders”! 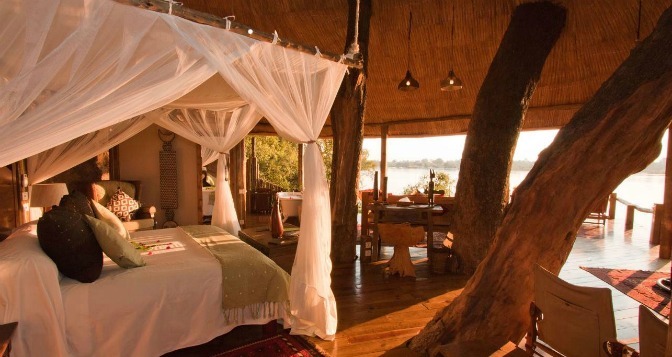 I stay at Tongabezi Lodge in Tree House – my all time favorite room – recently renovated and more beautiful than ever. Travelling companion hosted in Riverside Cottage which is blissful – there is not a bad room at Tongabezi – just beautiful and more beautiful … and then there is the proximity of the river. Right beside you at dinner on deck, right below you from your room and right around you from the “lookout” – a wifi beacon beside the river. Don’t get wifi hopes too high … you get the occasional important email through which is how it should be. 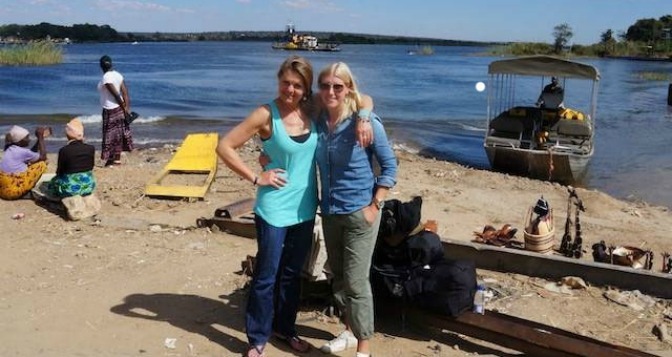 Road trip begins again with drive to Kazangula border crossing – four countries meet on Zambezi and there is no bridge! Zambia, Botswana, Namibia and Zimbabwe. 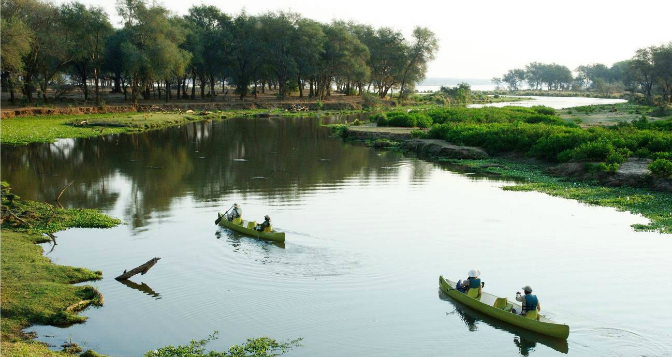 We ferry across in style – some are not so lucky and make their way in dugout canoes – much contraband crossing back and forth and border authorities in smart speedboats are vigilant chasing suspects into the reeds and channels of the river. 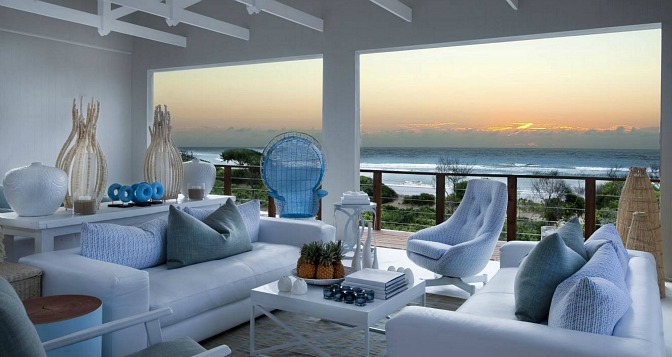 You could spend all day here watching the goings on. Four days in Botswana and six flights on small planes onto dirt strips to visit lodges. Guides park vehicles strategically to mark where large animals are close to the runway. The pilots are living the dream … young Frenchman from Lille relocated after coming here on vacation 4 years ago – now flies guests and cargo. Paul from Scarborough in Toronto meets us on runway at Kasane to fly to Linyanti – does not miss Canadian winters and gets to fly every day he wants to over the most beautiful places. Blond Capetonian and young hilarious local chap who pilots our first flight and looks about 12 tells us he just secured his licence from “someone in the waiting room”. He then expertly whisks us away detouring for us over herds of elephant and buffalo and puts us down with silky smoothness on dirt runway. African Bushcamps for the night – beautiful tents, incredible food and a magical sunset on the newly formed delta in front of camp. African Bushcamps’ founder Beks Ndlovu just voted finalist in Best Personal Contribution to Safari Tourism in Africa for his tireless work in conservation and development in remote communities where his camps are located – he happens to be in camp to share all with us over delicious meal and late night fireside conversation – fully interrupted by hippos very close by. Safari express up at sunrise and onward by small plane, as we are waiting for plane to land a pack of wild dogs come onto the runway and check us out before nonchalantly throwing themselves down under a tree. The pilot who obviously saw them steps out and asks if we have water or a sandwich … guess wild dogs on runway a common occurrence. It is common courtesy to bring food and water for the pilots who have nowhere to get it otherwise. Boat an hour into Baines Camp, overnight stop completely surrounded by water and 10 feet reed beds of the Okavango Delta. We spend restful afternoon on deck doing absolutely nothing in anticipation of our morning outing to walk with elephants. Very reluctant, this is not my thing, have been brought up with the notion that wild animals are wild and one should stay as far away as possible at all times. However incredible experience – 2 hours in the wild walking smelling, touching and hanging out elephants and their keepers. Following am “jet” off to Zarafa Lodge. I am riding shotgun, instruments touching my knees, rubber-necking over lagoon on one side and desert on other. Floods in 2009 turned everything into delta after 40 years of drought. Elephant swimming way below with just his trunk visible. Zarafa Camp arrival after mockish charge by elephant on our way from airstrip, we see our room, order drinks and invite Lodge Manager David Murray to hang out all afternoon – everything is beyond all expectations … elephant just metres from our deck, surreal outdoor shower at sunset, copper fire blazing in our apartment sized tent. Zarafa is 20% owned by National Geographic and the rest by Great Plains, high end lodge whose mission is to generate income through luxury tourism, all of which is redirected to preserve, protect from poaching and educate and include local communities. 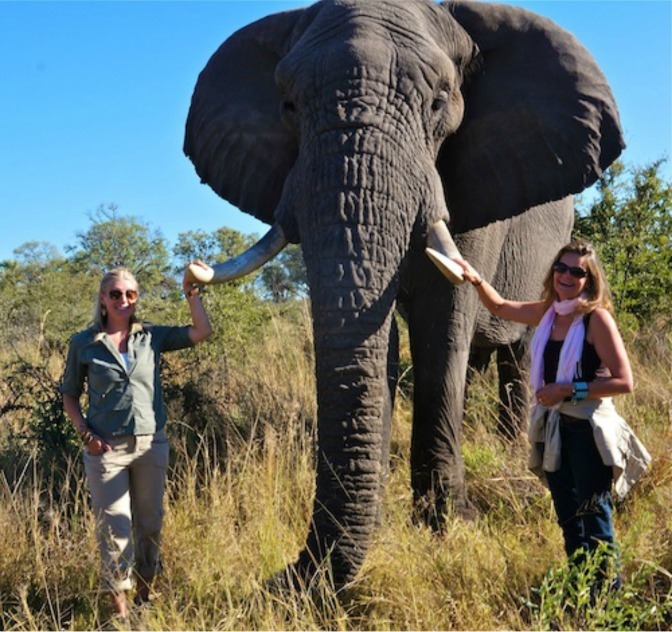 Fantastic “photo safaris” by day and “wine safaris” by night with kilt clad David Murray – “the impala” – common, light, eats grass, sauvignon blanc? “African Fish Eagle” – large, bold, dominant, sits in trees (wooded), chardonnay? “sable antelope” – rare, shy, dark, good with lunch, pinot noir? And so it goes on late into the night. Sister camp Selinda close by and home of the Selinda spillway canoe trails, 3 or 4 days of lazy days camping in style. This was the beginning of magical few days. First stop late night arrival Maputo, dusty laneways with kids playing football in the dark. Dinner of giant, I mean GIANT, king prawns with peri peri sauce on patio of beautiful old colonial Polana Hotel. Early morning walk around the sea walls and then we are picked up by helicopter and fly 30 mins to White Pearl Resort. Owner flies with us, his enthusiasm infectious – apparently resort was inspired by Ibiza where he spent college holidays. Picture perfect chic, 22 room deserted beach resort with very breezy and cool rooms on hill overlooking ocean – outdoor showers make us nervous. Kayaks, paddleboards, swimming with dolphins and massages keep us occupied. In room amenities include homemade cookies and excellent coffee to watch the sun rise. Up early and flight from Maputo to Vilancoulos about half way up the coast. Destination, Marlin Lodge, which we get to by speed boat across incredible blue ocean laced with sandbars, dhows weaving expertly between them. Long, delicate fishing nets criss-cross and fisherman seen walking literally miles from shore in low tide. 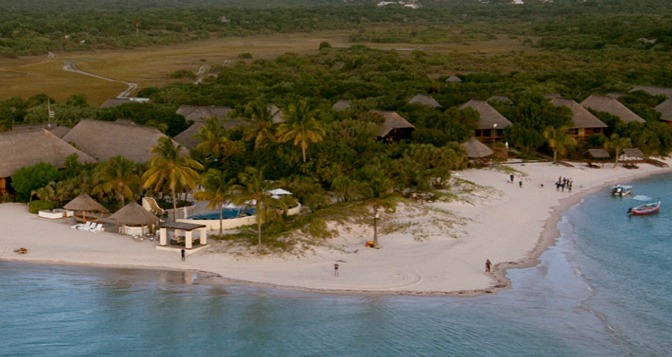 Marlin Lodge, a series of perfect cottages on a spit of land covered in palm trees. Lunch and afternoon of boating and swimming. 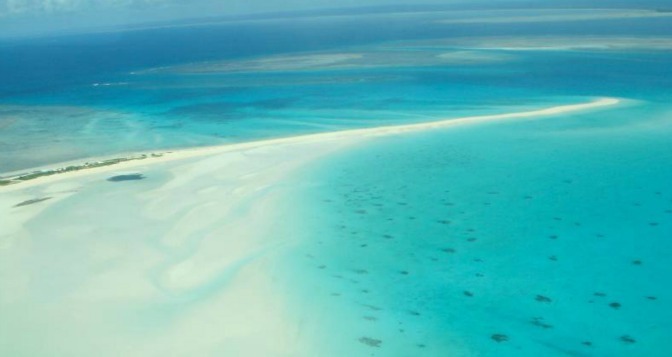 Only 2,000 inhabitants on island, which has been declared a national park. Soccer match with one team each from staff at 3 lodges on the island and the local team – the Crocs. Locals and guests cheering. Food is fabulous, wines imported and sunset and barefoot drinks on the beach – absolutely and completely relaxing and a million miles from anywhere. Fantastic dinner in wine cellar and then off to Azura Lodge just around the bay. Another beautiful resort – you could spend weeks here and contemplate it … looking up properties for sale on the Internet. Villas all have private pool, massive private outdoor showers and direct access to the beach. Agridio, a man with the gentlest manner and best service of the trip, began in a village in north Nampula Province. He worked himself ragged on the massive gas pipeline feeding gas down the coast of Mozambique from the border with Tanzania. After suffering a major injury with a metal fragment in his eye, he lost his job and sought medical help in Vilancoulos. Whilst recovering, he saw an ad for “english speaking” workers on nearby Benguerra Island. He made the journey across the blue channel by dhow with other applicants. “I stayed – 19 went home – because I could speak English” and now he serves fabulous meals at the Jellyfish Restaurant on the beach. Wonderful Faisel, takes us kayaking and tells us of his journey from birth in Zimbabwe, to the UK, Portugal, Spain and Ethiopia with his teacher mother.